Connecting Anime and Manga with the exciting world of gaming, UP AME brings you the much awaited and much anticipated AME 1UP on February 23, 2013, at the Hall D of the World Trade Center in Pasay City, Philippines. 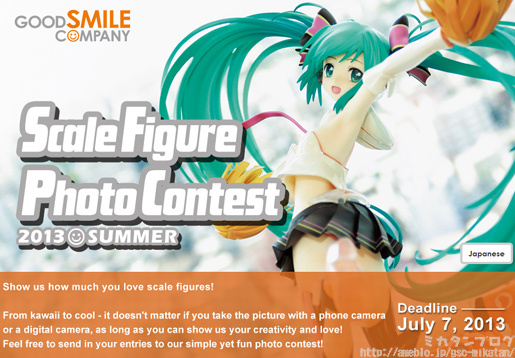 Contest registration is now open! Go to http://fair.up-ame.org/ for more information. Snacks’ Note: 100th post! Woohoo! This year’s Wonder Festival Summer was held yesterday at Chiba, Japan. WonFes is a huge bi-annual event where sculptors display and sell Garage Kits and major figure manufacturers give a preview of the figures that they will be releasing in the coming months. I felt that yesterday’s WonFes wasn’t as grand as previous ones, but as expected there were some fantastic figures on display that I’m looking forward to getting in the near future. All of the figure images in this post were taken from Akiba Hobby and Hobby Stock Blog. Do check out their fantastic WonFes coverage posts! And so without further ado, here’s my WonFes wishlist! For its ninth year anniversary celebration, the University of the Philippines Anime Manga Enthusiasts leaps through boundaries as it turns the pages of time back to the age of feudal Japan! Get ready for a historical event as your favorite collegiate anime organization presents yet another timeless anime fair! Cosplay Competition ● Dubbing Contest ● Tea Room ● J-Music Concert ● Fanart Contest ● Fair Booths ● Karaoke Contest ● and many more! Presale tickets at 90 pesos, regular tickets at 100 pesos; purchase your presale tickets at the Level Up! Live event and the Anime Overload Festival on November 7-8, as well as other UP AME Booths! For more information, contest mechanics and event updates, please check the OFFICIAL FAIR MICROSITE or the UP AME FORUMS! The UP Anime Manga Enthusiasts (UP AME) is the first ever recognized collegiate anime organization in the Philippines. 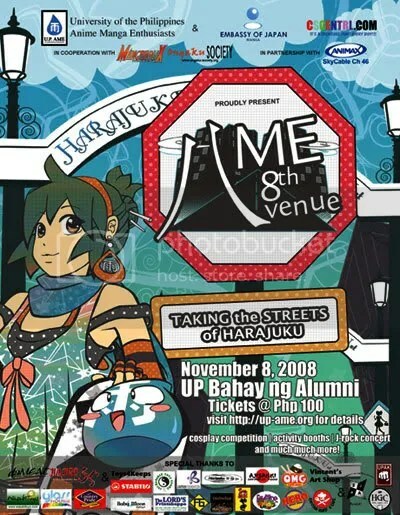 They are also the same group behind previous successful events such as the Una kAME!, kAME Ulit!, AME Matsuri, AME Gakuensai and AME 8th Avenue. Oh, and check out College Courses Online. Taking the Streets of Harajuku! COSPLAY COMPETITION! J-ROCK CONCERT! AME CAFE! FANART CONTEST! NOVELTY BOOTHS! KARAOKE SING-OFF! WANT SPECIAL FREEBIES? JOIN OUR 8TH AVENUE STUB PROMO! Visit all five of these booths and collect each of their respective stubs to have them exchanged for a special freebie pack! ☁ AME 8TH AVENUE CAFE: Add a visual twist to your leisure eating by going to the 8th Avenue Cafe, the perfect place to unwind and relax during the convention. The booth sells desserts and drinks, but there’s more: you also have the option of choosing the waiter or waitress cosplaying as characters from Code Geass who will serve your food and entertain you. ☁ SPEED DATING BOOTH: Speed dating right at the heart of the Avenue life! Meet new people and your favorite cosplayers and make friends in a snap with this fun and unpredictable experience! ☁ DARTS BOOTH: Pop! Burst! Strike! How good is your hand-eye coordination? Test it out here as you aim and pop the balloons for mystery prizes! ☁ WIRE MAZE BOOTH: A challenge of concentration and the steadiness of the hand! Maneuver the probe along the wire without touching it to win cute prizes! ☁ PHOTOBOOTH: Forgot your camera? Need a nice spot to take pictures against? Want a hard copy of your shot on the day itself? Look no further – our photo booth and its roaming photographers will solve your problems! We’re also pleased to report that the deadline for submissions to the Fanart Drawing Contest has been extended till 2:00 PM on November 8, 2008! Please continue to submit your entries for a chance to win great prizes at our fair! Cosplay registration forms are up! Download the individual, group or Harajuku reg forms by clicking on the name of the category, or visit the topic on the forums for the links. AME 8th Avenue: Taking the Streets of Harajuku! 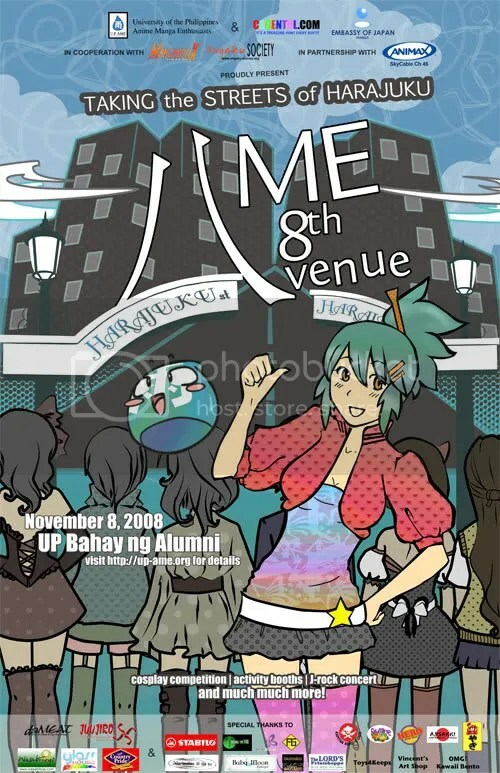 The University of the Philippines Anime Manga Enthusiasts turns eight this year! 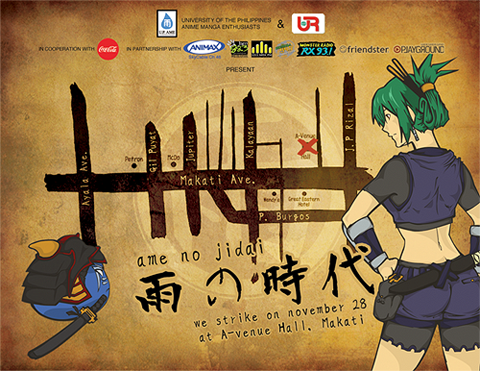 Once more, the Philippines’ top collegiate anime organization rocks the scene with another sensational anime fair! For more information, contest mechanics and event updates, please check the official website of the University of the Philippines Anime Manga Enthusiasts at UP-AME.ORG, or the UP AME Forums. The UP Anime Manga Enthusiasts (UP AME) is the first ever recognized collegiate anime organization in the Philippines. They are also the same group behind previous successful events such as the Una kAME!, kAME Ulit!, AME Matsuri and AME Gakuensai.